What Will The Vikings Do At Quarterback? The Vikings have a tremendous decision to make this offseason at the quarterback position. The official day to start placing franchise tags and transition tags on players starts today, February 20th. The 3 quarterbacks that played snaps for the Vikings in the 2017 season are all free agents. Mike Zimmer, Rick Spielman, and the newly named offensive coordinator John DeFilippo will all have an input deciding which direction this team will go in, but at the end of the day, this is the NFL and it all comes down to every last dollar. There are many directions the Vikings could go in with the draft class and free agency heavy with quarterbacks. Luckily the salary cap is about to rise again and teams are expected to have an additional $11 million. The Vikings will have around $60 million. They will have to be wise with their decision at quarterback because 5 starters, including Anthony Barr and Stefon Diggs will reach the end of their contracts after the 2018 season. The first option Minnesota has is the guy that took the team to the NFC championship: Case Keenum. 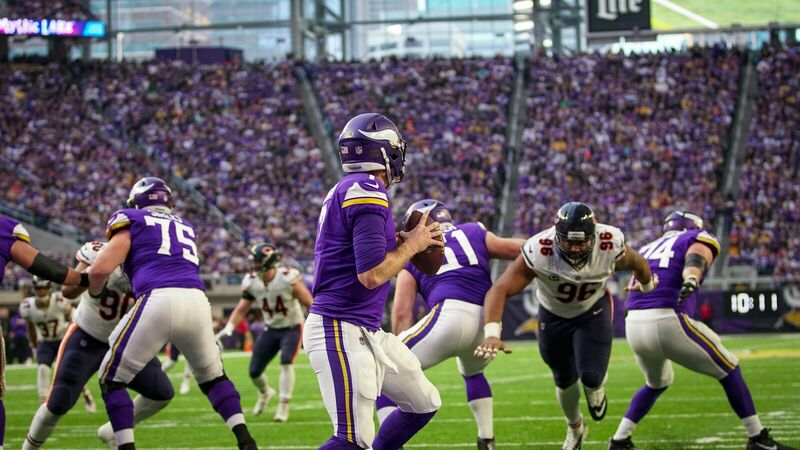 He will probably cost the most out of all 3 of the Vikings' free agent quarterbacks but as the world saw last season, Keenum has some real potential and everyone can see the great chemistry he has with all the receivers, Thielen especially. The Vikings might use the rarely used transition tag on Keenum to make sure that the year he just had was not a fluke and that he can thrive just as well under a new offensive coordinator. Keenum would want about $15-$20 million which might be a bit of a push, but if Minnesota sticks with him, GM Rick Spielman will likely be able to work some magic to work out the cap space for the coming years. The next most likely option is Teddy Bridgewater. This is a more sticky option as the Vikings, from head coach to the front office, love Bridgewater and have spent almost 2 years anxiously awaiting his recovery. Keeping in mind that Head Coach Mike Zimmer is a very old school type of guy who believe's that injury should not be the reason a player loses its job, it is easy to see Zimmer root for Bridgewater. The recent hiring of John DeFilippo shows that the VIkings might be leaning towards Bridgewater because the type of offense DeFilippo runs is the type Bridgewater ran back in Louisville. It was also evident in the 2017 season that Zimmer did not fully trust Keenum as he activated both Bridgewater and Bradford off of IR to back Keenum up in the playoffs. Bridgewater would certainly be the cheapest option as he would be likely signed to a "prove it" deal worth around $5-$8 million. Sam Bradford is the 3rd guy that played snaps for Minnesota last season. Purely based on talent it is arguable that Bradford is the best QB out of the three options, but the Vikings needs somebody that can stay healthy all season long. His knee situation is currently not very clear as he could easily aggravate it again, if he played a full game. Bradford is certainly the most risky choice and Minnesota will probably let him walk. If they signed him he would assumably be a very high class backup. The most stand out option who wasn't a Minnesota Viking last season is Kirk Cousins. Cousins is set to leave Washington this offseason and even though many don't consider him a top 10 quarterback, the stats are all there. This past season Cousins threw for 4,093 yards, 27 touchdowns to 13 interceptions with a 64.3% completion rate. Cousins manages to pull out these kind of stats while not having a good receiving core or very versatile running backs at hand. Lots of people can hardly imagine what he could do with Minnesota's offense. Being the hottest option in free agency, every quarterback needy team is going for Cousins. Recent reports for BleacherReport said that the Jets would be "willing to pay Cousins whatever he wanted." Teams like the Browns and Jets have a lot of money and Minnesota hasn't ever been the sort of team to spend all their cap space on a quarterback, even though a solid quarterback is all they need to reach their Super Bowl. Cousins is not totally off the list as he did say earlier that he desires to go to a winning team and out of all the teams that need quarterbacks, Denver and Minnesota are the only ones with all the pieces. A new quarterback that has recently emerged in the mix is A.J. McCarron who was formerly a Cincinnati Bengal. McCarron threw the only touchdown Cincinnati scored versus Minnesota in Week 15 of the 2017 season which is an impressive feat for a backup quarterback against the best defense in the league. McCarron is a cheaper option, but likely along the lines of a Plan F or G as the ceiling is not very high, but the offensive coordinator DeFilippo and quarterbacks coach Stefanski could develop him during training camp and offseason. Signing McCarron is a risk as Minnesota hopes to finally check one last box off and bring the Lombardi home next season. Some other vague options that probably wont happen include free agents Matt Moore, Ryan Fitzpatrick and the gold card, Drew Brees. It is surprising that the Saints have not franchise tagged him yet, but Brees has said he wants to be a Saint for life. Moore and Fitzpatrick are both backups with low ceilings most likely not fit to be in Minnesota. Moving on to the draft, the Vikings have the 30th overall draft pick, but with this draft quarterback loaded don't be surprised if Minnesota opts to take a quarterback in the first or second round. If the Vikings go for a quarterback in the first round, they would most likely end up with Lamar Jackson of Louisville but with the 29th overall draft pick in the Jacksonville Jaguars seeming very interested, that could be negative. If Minnesota goes for a quarterback in the 2nd round after maybe solidifying and adding depth to their offensive of defensive lines, they could end up with Mason Rudolph of Oklahoma State. Unless the Vikings can trade up and get a really extraordinary quarterback, most would agree that Minnesota is not going to experiment at this time, when the rest of their team is in their prime. This is the most important offseason for the Vikings and the whole league will keep their eye on Minnesota's actions as other teams are willing to jump in and take the quarterback(s) the Vikings discard. Whatever move they make will break hearts but really define the team they want to be going forward.